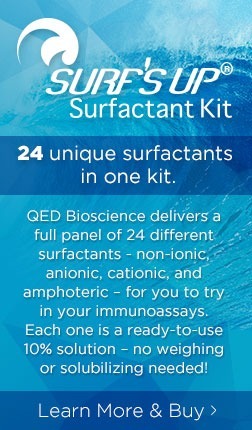 Quickly and conveniently purchase immunoassay test kits from QED Bioscience. We offer a immunodiffusion kits with results that can be inserted into manufacturing documents or laboratory notebooks. These high-quality assay kits let you compare results over time and can also be used to monitor the consistency of antibody products.Stock up on immunoassay kits from QED. Our kits include all of the reagents and supplies that you need to custom design ELISAs for your projects. For more than 20 years, QED has been the name to trust for immunoassay test kits, so you can count on quality.